The MEFA Magnum parcel can accept mail and parcels up to a size of 100mm (height) x 390mm (width) x 200mm (depth), also including large lever arched A4 files perfect for educational facilities. The MEFA Magnum parcel box is typically wall mounted and supplied with spacers which allow for the item to be fitted with enough room for the lid to be lifted without contact with the property wall. The parcel box can also be fitted to a stand for freestanding fixing into concrete. Parcels are entered into the top of the product by lifting the lid of the item, which raises a shelf plate for placement of the parcels being deposited. Once the parcels are placed on to the shelf plate, the lid should be lowered which allows for the items to drop into the bottom of the MEFA Magnum box. When the lid is lifted up after items have been deposited, the items cannot be retrieved as the shelf plate is also raised at the same time. This security function ensures that deposited items remain secure at all times until the recipient opens the front door of the parcel box using a coded key. 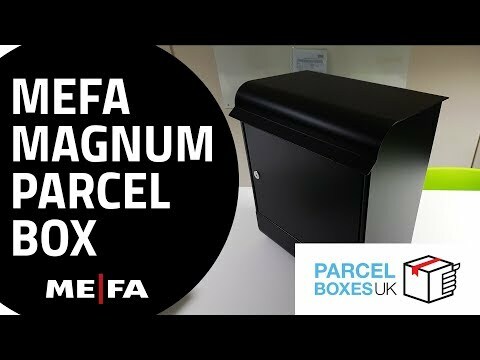 – WHAT SIZE PARCEL DELIVERIES CAN THE MEFA MAGNUM HOLD? The MEFA Magnum parcel box can securely hold a variety of different parcel delivery sizes, as detailed in the MEFA Parcel Box Size chart. It is possible to hold multiple parcel deliveries at once, as long as they are of an acceptable size and the parcel box is regularly emptied. – WHERE CAN I INSTALL THE PARCEL BOX? The MEFA Magnum Parcel Box can be installed in either an external location outside a property, or internally in secured location. If the parcel box is being used in a residential property, then the most common position for situating the box in on an external wall close to the property entrance door. This allows the post delivery personnel to deliver parcels without having to be given access to a secured location. If used in a commercial environment, then the location of the box can be either external (as per previous example in residential environment), or internal if the parcel box is to be used for internal processes.